Friday to Friday comes and it gets so hard to come with a new dish for lunch! This is my favorite rice dish and it's super easy and quick to make. It's defiantly different from the biryani or akni or dhal. Braise the onions with ghee (clarified butter) or olive oil with whole cumin. When golden; add the chicken cubes with the salt, green chutney, red chili powder and lemon juice. Top with a little water and cook for a bit. Next add the mixed vegetables (you can use frozen ones or if you have fresh veggies in your fridge use those). Add the liquidated tomatoes (one or 2 depending on how much you're making), cook a little more but don't over cook. Top with boiled rice and mix well. Serve with dhai and a light relish. DHAI - sour milk, green chutney; whip well! LIGHT RELISH - yogurt, green chutney, cubed cucumber, cubed carrots, cubed colorful peppers; mix well and serve cold. 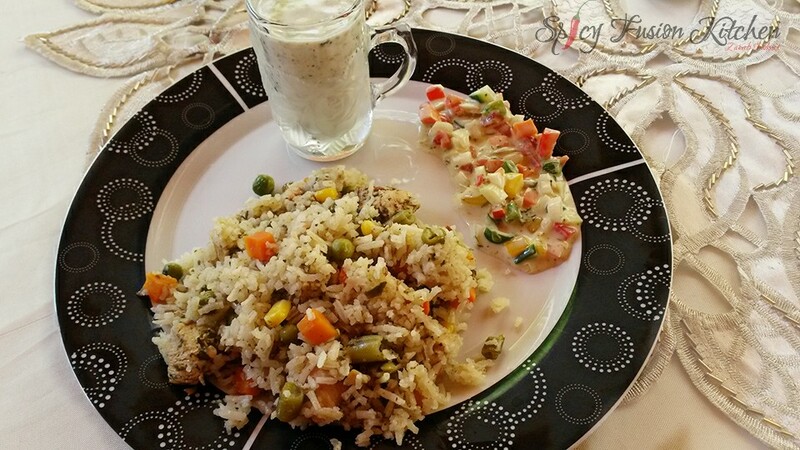 Yeah it gets hard to try and switch it up and usually Friday has to be a rice dish in the traditional sense, my family loves to try new rice dishes and the kids will love this, its very light as well and healthy. Hmmmm looks soooo goood!!! 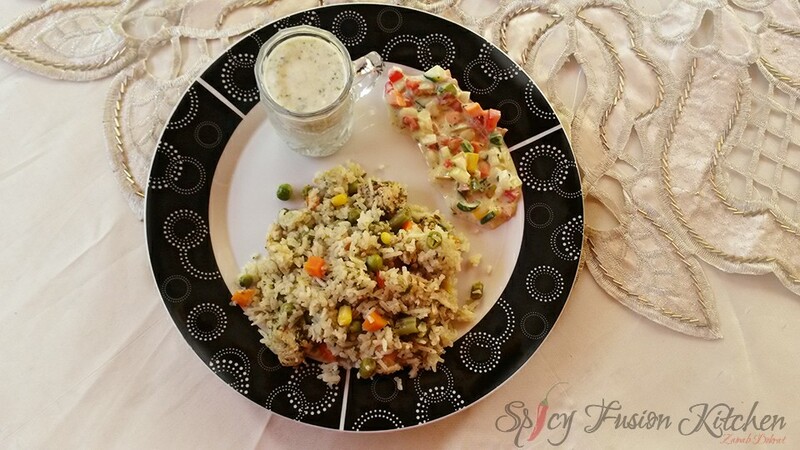 I love rice and this looks so easy and quick to make - which is always a bonus! Yes it is! :) Jazakallah for commenting, I hope you give the recipe a try. I love rice in any form.. but we have it so rarely.. and Fridays. I tend not to cook at all! :-P. neat and easy recipe.. and that plate is good one! I always make fried rice so this would be a great alternative for something slightly different. I love all the veggies and colour combination. Makes for a healthy alternative to eating rice. I love colorful dishes lol I think everyone eats with their eyes also especially kids so this will really get them to eat their veggies. Hello, MashaAllah, what a wonderful recipe this is... and it looks really nice. Thanks a lot for such an easy and delicious meal. If a wont add liquified tomatoes than it goes the same way? I haven't tried without tomatoes, they make it more gravy like so it's not so dry. Looks yummy,but I don't have green chutney. Can I make my own?